More than 25 years ago, a commercial warned us about the future of computers. Closed. Censored. Dark. A "garden of pure ideology." How strange that that's exactly what the future of Apple's computers looks like today: the Mac App Store. OSX 10.7—the Lion!—features an App Store for the Mac. It's the philosophy of the iPhone and iPad, imported to the desktop computer, and it could be amazing. No more viruses. No more unstable programs. A clean, consistent, safe computer paradise where everything works properly, where the streets are paved with brushed aluminum and the skies are always clear as a retina display. An electronic Camelot? For some, maybe. Computers used to run applications or programs, but Apple has slowly turned everything into an "app." The word is cute, simple, fun. Non-threatening. But also trivializing. Apps are disposable. The word "application" is more of a mouthful; it has a certain weight, and distinction—at least cognitively. Are Final Cut Pro and InDesign just apps? Throwaway impulse purchase that you toss a few stars at and never think about again? The simple act of labeling all third-party programs apps makes them much less significant: tiny bits of content cowering under the aegis of Apple's mighty platform. Right now, downloading and installing an application is complicated—even on oh-so-simple Macs: Figure out what you need. Compare options. Go to a developer's website. Download a disk image. (Or if you're lucky, a straight ZIP file.) Mount it. Pull the app from the image, and drop it into the Applications folder. This is not trivial, and a lot of people get it wrong. So an App Store that radically simplifies shopping for and installing applications could be a powerful idea that makes computing easier, even better, right? For some, sure—just take the iPhone as an example of how making technology accessible can radically change an industry. The ease of Apple's mobile App store changed smartphones forever. Legions of self-described Luddites cast their feature phones aside and picked up the most sophisticated mobile device ever created. They felt comfortable and empowered at the same time. But the question here is whether people want the same experience on their computers. Just because the line between a smartphone and a portable computer is becoming increasingly blurred, doesn't mean the two technologies should be treated the same way. When you're just trying to watch a movie, play a game or read a book, nobody wants complication. So it's largely okay that Apple maintains such tight control over apps for the iPhone and iPad. They're technically computers, yes, but we expect a totally different kind of experience. It's the price we pay for largely trouble-free computing. Apple wants to bring that experience to all personal computers. And that's commendable, in a lot of ways. But part of what makes a PC more powerful than an iPad is that you can install any program you want. A macro program that fills in sentences after you tap just a couple of letters. A system-wide notification app that any program can tap. A BitTorrent client. For Apple's way to work, it has to control every facet of the computing experience, turning the PC into a closed system. An electronic Camelot? Might be more like an electronic Stepford: When you think beneath the shiny surface of the Mac App Store, it's kind of a scary thing. Some of Apple's rules for the Mac App Store are logical. "Apps that crash will be rejected." Apps can't transmit location data without your permission. These make sense. But the rules get real restrictive, real fast: No apps that are in "beta" "demo," "trial," or "test" stages. Apps can't install icons on the Dock. They can't "rapidly drain a product's battery or generate excessive heat." Oh, and "apps that enable illegal file sharing will be rejected." So, no BitTorrent. Or beta apps like Apple's own FaceTime. Basically, powerful programs that reach deep don't fit the mold for an app, even though they can be tremendously useful. But Apple's reach goes further than controlling technology: No apps that "encourage excessive consumption." Apps can't misspell Apple product names—like iTunz. Apps can't look like Apple's applications either. Apps "with metadata that mentions the name of any other computer platform" are out. Apps can't be defamatory or "mean-spirited." (Unless you're a professional satirist.) No apps that replicate pre-installed applications—like Mail. 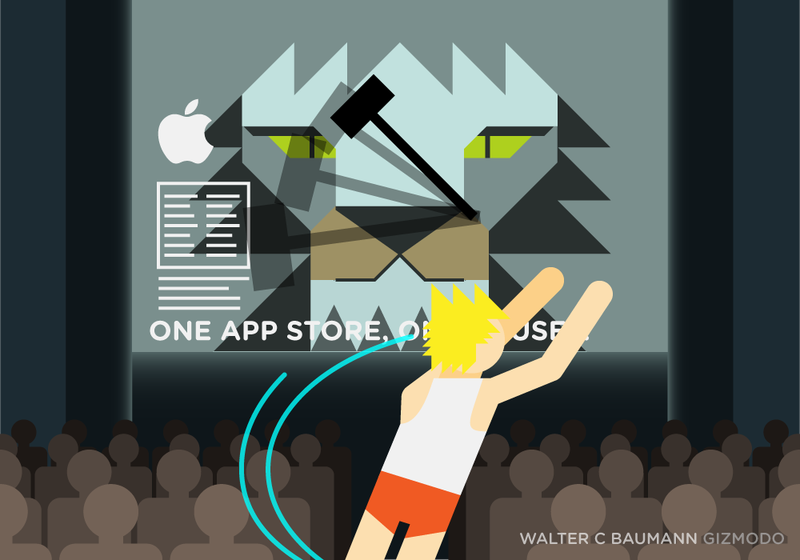 Apps can't portray "realistic images of people or animals being killed or maimed" or shot. Goodbye Call of Duty. No "Chat Roulette" apps. Is this the kind of computer we want? A closed, completely controlled platform that hews to one company's vision of what we should be watching, downloading or doing? It is frighteningly easy to picture a Mac where all your apps have to be approved by Apple; all your music, movies and TV shows are streamed from iTunes; all your books come from iBooks. This will be totally fine for some people. But as the rest of us become increasingly comfortable molding our computing experience to our own needs, this strict environment starts to seem claustrophobic—even technologically totalitarian. It's still startling to think, even after the last few years of the App Store on the iPhone, that this is coming from the same company that made the 1984 ad over 25 years ago. For now, App developers can still sell and distribute apps the same way they always have, outside of the Mac App Store, and we'll still be able to download and install them the old fashioned way, willy nilly. But the incentives for developers to go through the App Store are going to be mighty powerful, possibly irresistible. Overwhelmingly, it's going to be the way Mac users find and buy apps. How long before it's the only way to sell apps on the Mac? It feels inevitable, just like the App Store creeping over to OS X. Apple is slowly starting to grip the rest of the Mac more tightly to pursue its vision of the future of computing, which is more iOS than OS X. More 1984 than 2010.